As part of the project Target Zero, BCSA (British Constructional Steelwork Association) has drawn up a guideline for the design of energy-neutral steel framed buildings for five common building types. Below is a summary of the design guidelines for a supermarket. This is the energy for heating, cooling, lighting and ventilating the building: the building-related energy. In addition the building also uses energy for IT and all types of apparatus such as refrigerators and microwave ovens: the use-related energy. As a rule of thumb this is about +20% energy. The energy for materials is the energy used for production, transport, assembly, demolition and recycling of building materials: the material-related energy. 2019: 127% reduction compared to 2006 (Now the use-related energy must also be compensated). 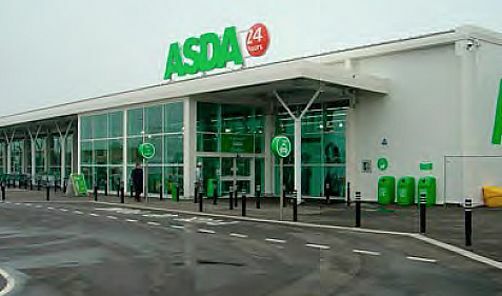 The reference building is the Asda supermarket in Stockton-on-Tees in the United Kingdom (see image). The building has a surface area of 9,393 m2 divided over two floors. The supermarket itself is 5,731 m2. The remaining area consists of offices, a storage area, a bakery and a canteen for the employees. The supermarket is constructed on a 12 m square grid. The storage area is on a larger 16 m square grid. A number of building physical parameters have been adjusted so that the building exactly meets The Building Regulations 2006 Part L (see table). 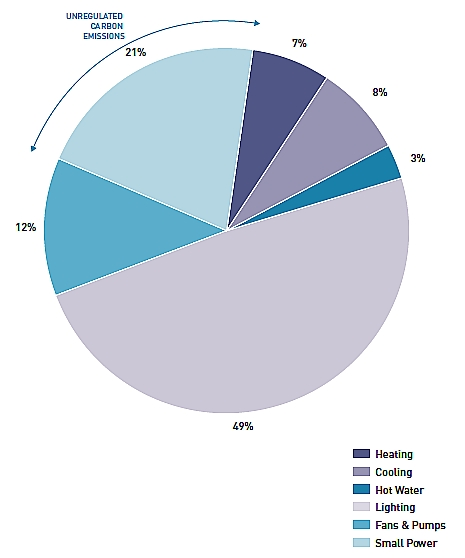 The distribution of the energy use in the reference building is shown in the pie chart below. Lighting is responsible for the majority (49%) of the energy consumption. This is followed by fans and air pumps (12%). Cooling and heating are relatively even at 8% and 7%. The use-related energy (21%) is not considered. Distribution of energy consumption in reference building in accordance with Building Regs. 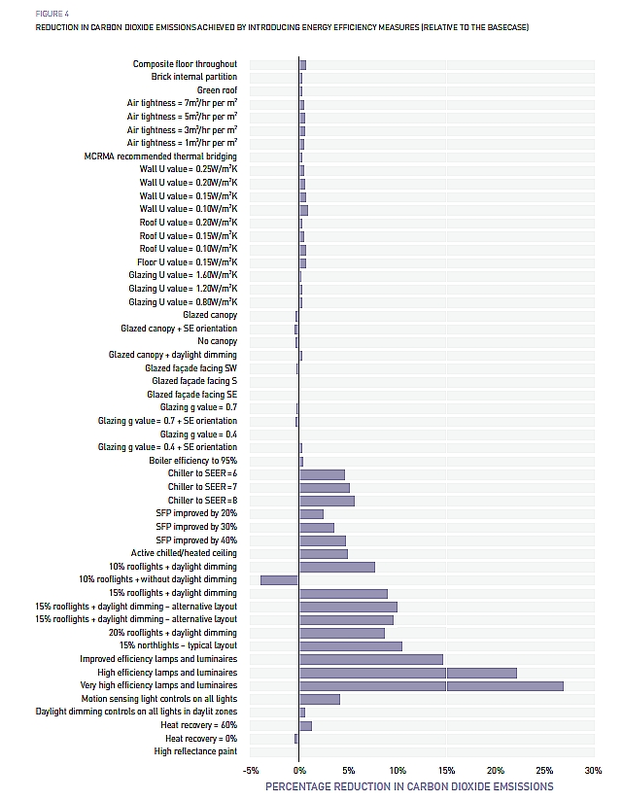 2006 Part L.
The figure below shows the CO2 emission savings of more than thirty energy-saving measures. 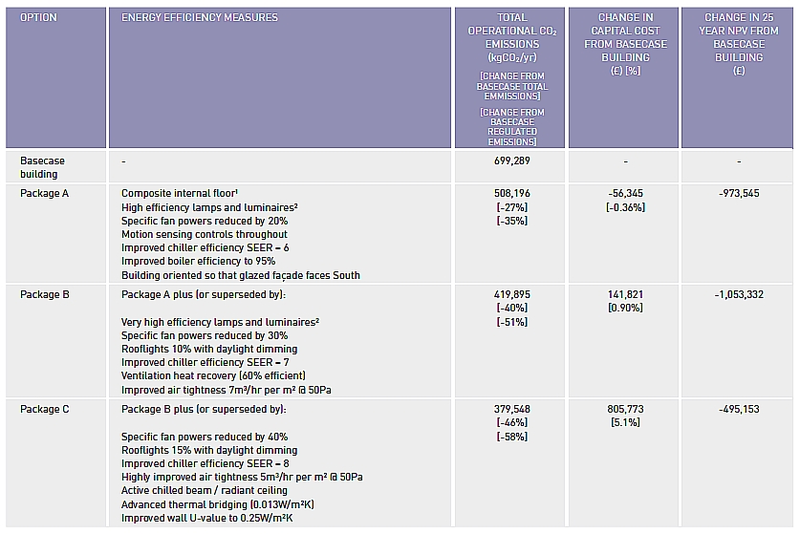 Remarkably, highly efficient lighting alone can provide savings of 27%. Furthermore, with 15% skylights it is possible to make a saving of 10%. In general insulation provides small savings (less than 1%). Increasing the efficiency of the cooling system (= SEER) gives a saving of around 5%. This is because less solar heat enters the building, and therefore more heating is required. Effect of energy-saving measures on CO2 emission. The various energy saving measures are placed in packages A, B and C (see table below), where A is the least comprehensive and C the most comprehensive package. For each package the table shows CO2 emissions and saving on CO2 emissions in percent. In addition, based on LCC (Life Cycle Costing), the savings in initial investment and cost savings after 25 years of data are given. These savings include capital costs and maintenance. The least extensive package, ‘A’ provides a saving on investment costs of 0.36% and provides a saving of 973,545 over 25 years - a good investment. Energy saving and cost saving from packages A, B and C.
The figure shows the initial investment and also (last column) the savings over a period of 25 years. These savings include capital costs and maintenance. Package A gives a saving on investment costs of 0.36% and provides a saving of 973,545 over 25 years - a good investment. The use of energy-saving measures alone does not enable compliance with the requirements of the Building Regulations, Part L. For this reason energy generating techniques must be employed. In total 37 techniques were examined, including wind turbines, solar cells, heat pumps, fuel cells and fermentation plants. 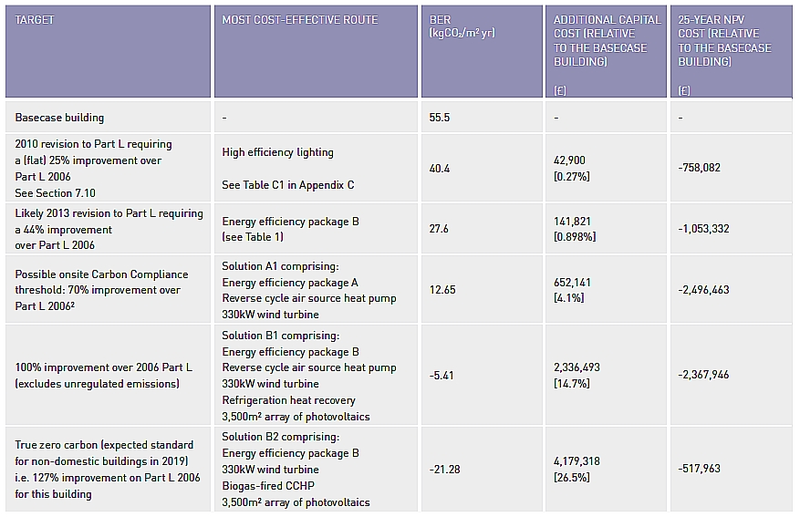 The table below shows which combinations of packages with energy-generating techniques will be an economical way of complying with Part L.
The table shows that an additional investment of 4.1% results in 70% less CO2 emission. In addition this generates around 2,5 million. This enables the supermarket to meet the 2016 requirements. The entire report is available from the download section.